Learn how to validate the pure steam by testing non-condensable gases, steam dryness, pH, conductivity, microbial contamination and endotoxin tests. 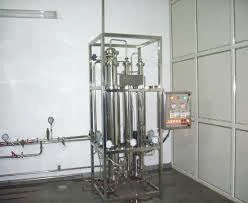 Pure steam is used in various operations in pharmaceuticals but its use in sterilization is very common in pharmaceutical sterile manufacturing. The pure steam system should be qualified. A WHO guide to good manufacturing practice (GMP) requirements-Part 2: Validation (page-11) clearly says to perform the performance qualification of pure steam. At the time of performance qualification of pure steam generation system, the sample shall be taken from each steam user point and analyzed for three consecutive days. The purified water system must be qualified before starting the qualification of pure steam. The sampling of Pure Steam: Sampling for Bacterial Endotoxin Test and chemical tests should be done separately. Depyrogenated tubes or bottles should be used for taking the sample for bacterial endotoxin test. Allow the steam to drain for minimum one minute. Open the cap of the bottle and fill the bottle with steam condensate by holding the bottle in the holder. Gloves should wear into the hands while sampling the pure steam. Tighten the cap of the bottle and mark with the sampling information. If the sample is not analyzed within 2 hours of sampling, store the sample at 2-8 °C. Analysis of Pure Steam: Pure steam should be analyzed for following tests. 1. Non-condensable Gases: Non-condensable gases are air and carbon dioxide those do not condense with the steam. These are generated due to their presence in the purified water that continuously circulates in the water distribution system. Non-condensable gases should not be more than 3.5%. 2. Steam Dryness Value: Dry steam has more energy than the wet steam. Wet steam has water with it and does not have heat energy as dry steam. Dryness of steam is determined by the latent heat. Dryness of the pure steam should not be less than 90%. High moisture content can cause the loss in energy of steam and that may cause the longer sterilization time. 3. pH: Steam condensate is analyzed for pH value at 25 ° C. It should be between 5-7. 4. Conductivity: Conductivity should be tested with calibrated conductivity meter at 20 °C. Conductivity should not be more than 1.3 µS/cm. 5. Microorganisms: Steam condensate is tested for microbial contamination using pour plate method. There should not any microbial contamination in the steam condensate. 6. Endotoxin Test: Determine the endotoxin in the pure steam condensate and it should not be more than 0.25 EU/ml as in water for injection.